IOxOS Technologies introduces the IPV_1102, a 6U VME64x highly configurable Single Board Computer with embedded FPGA capability. The IPV_1102 is built around a high performance switched PCI Express architecture. The IPV_1102 provides in its front panel a PCI Express extension based on PCISIG standard “PCI Express External Cable Specification”. This high performance extension, which can be used to connect the IPV_1102 to a workstation with a memory mapped model, is implemented as a plug-in expansion IO module to support different physical media (copper/optical). The IPV_1102 integrates the latest generation of Freescale PowerPC QorIQ processors. The P2020 provides dual-core capability running at 1.2 GHz with low power operation (< 7[W]). It is supported with large System Memory (up to 4 GBytes), non volatile memory NOR, NAND, SD and multiple IO capabilities. 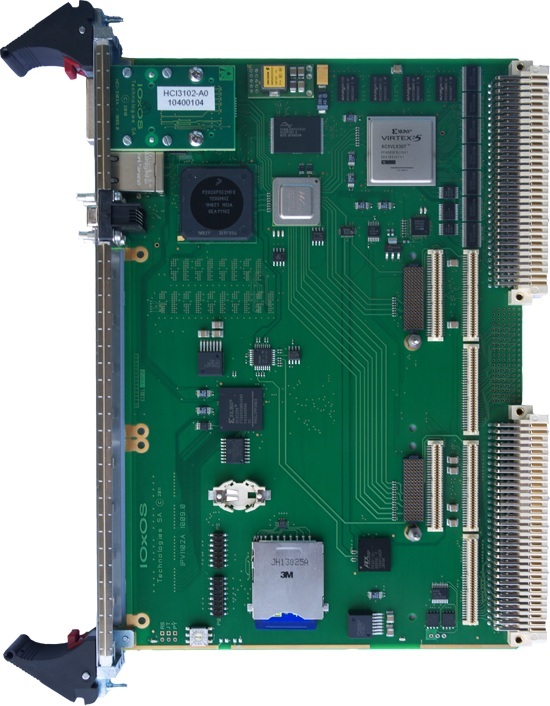 The on-board Xilinx Virtex-5T FPGA implements a high performance PCI Express centric Network on Chip (NoC) switched interconnection. This NoC architecture provides a non-blocking, controlled low-latency and high-throughput bandwidth interface between the data producer and consumer. The VME64x interface, which is also implemented in the FPGA, is implemented with a direct transparent low latency PCI-Express / VME64x bridge. It supports all Master/Slave VME64x modes of operation with Slot_1 System Controller. The IPV_1102 is powered by TOSCA I, a comprehensive FPGA Design Kit developed by IOxOS Technologies, which is available for the implementation and integration of custom applications within the IPV_1102 on-board Virtex-5T FPGA.